nor anything hidden that will not be known and come to light. The conventional wisdom asserts the Mendelssohn fragments quoted in Edward Elgar’s Variation XIII are unrelated to the Enigma Theme and by extension the whole of the Enigma Variations. This view is propelled by the recognition those melodic snippets originate from an outside work, Felix Mendelssohn’s Calm Sea and Prosperous Voyage Op. 27. 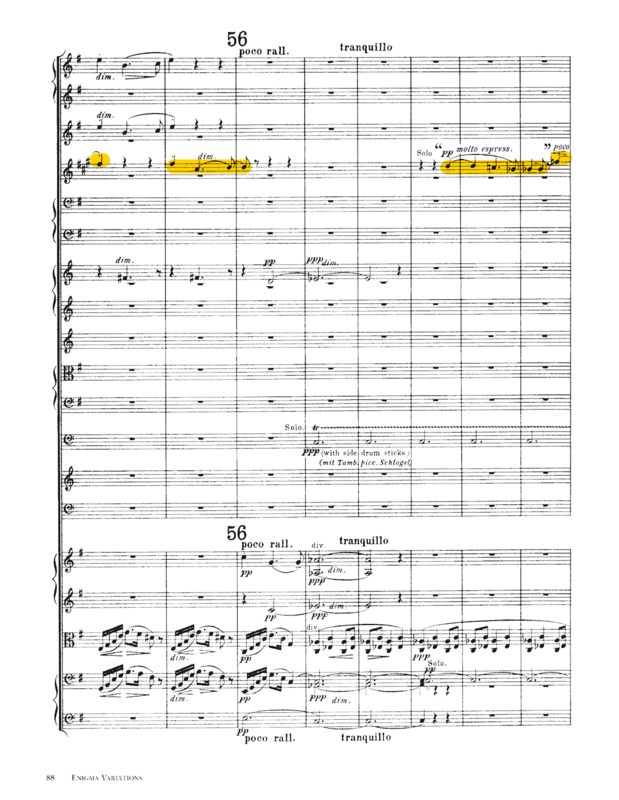 That concert overture is approximately thirteen minutes long, a duration that presents an intriguing parallel with Variation XIII’s Roman numerals. It is equally fascinating that the integers of the metronome marking for that movement (76) add up to exactly thirteen. The original German title—Meeresstille und glückliche Fahrt—is drawn from two poems by Johann Wolfgang von Goethe that were extremely popular when Mendelssohn composed his programmatic overture. There is a hint of irony in that deceptively serene title because Goethe was an early proponent of the literary movement Sturm und Drang which means “Storm and Drive.” With such an obvious foreign provenance, academics insist the Mendelssohn fragments in Variation XIII must be extraneous to the covert principal Theme, the “dark saying” mentioned by Elgar in the original 1899 program note, and the secret friend memorialized in Variation XIII. The scholars could not be more wrong. The Mendelssohn fragments are superimposed over a pulsating ostinato derived from the Enigma Theme’s palindromic rhythm of alternating pairs of two eighths and two quarters. The symmetry of those repeated eighth and quarter note pairs is suggestive of a passage from the Genesis account describing how the animals entered Noah’s Ark “two by two.” That ostinato figure reinforces the sonic imagery of a calm sea and is comprised of harmonic sixths rising and falling by melodic thirds. Such a combination of harmonic and melodic intervals subtly conveys the opus number (36) of Enigma Variations. 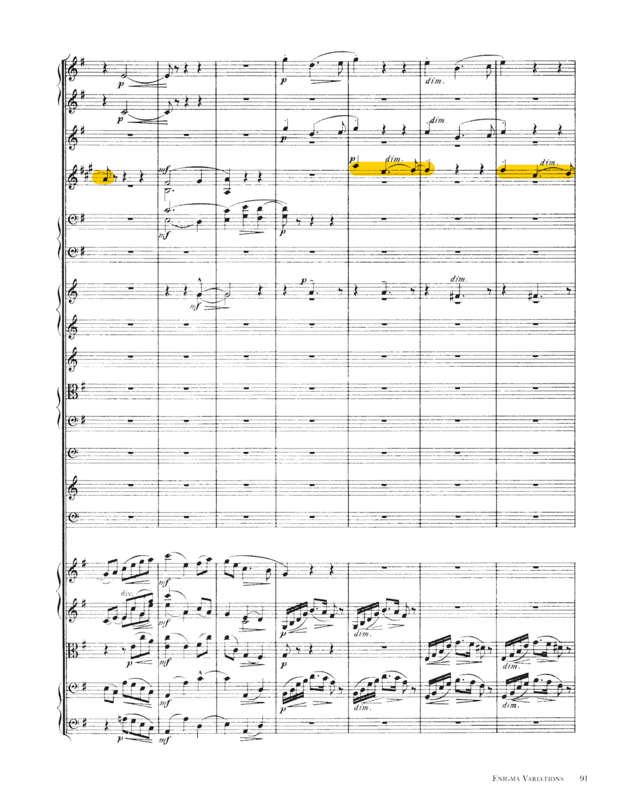 The orchestrated mingling of the Enigma Theme’s rhythmic structure with the Mendelssohn fragments implies a more nuanced connection between these two outwardly unrelated themes. There is far more to these Mendelssohn fragments than the perfunctory survey proffered by the academic community who neglected to do their homework. Elgar was an expert cryptographer who relished creating and cracking ciphers. This incontrovertible fact should cast these discoveries in an unsurprising light except for those who naively preclude the possibility of any cryptograms. A passion for this esoteric art is a principal feature of Elgar’s psychological profile. As he explained in the original 1899 program note, the Enigma Theme contains a “dark saying” that must be unguessed. That coded language openly implicates the presence of a cipher, for one meaning of dark is hidden, and a saying is made up of words and phrases. It is exciting to report that further research has unmasked a nineteenth cipher previously unseen and unappreciated lurking in the opening clarinet solo of Variation XIII. It is constructed from the written and concert pitches of the clarinet’s opening six notes. For this reason, it is known as the Rehearsal 55 Clarinet Solo Cipher. Before describing and decoding this cryptogram in detail, an overview is provided of the special part played by the clarinet in Variation XIII. The principal clarinet is assigned a singular role by Elgar in the Enigma Variations for it is the only instrument in Variation XIII that performs three Mendelssohn quotations from Calm Sea and Prosperous Voyage. Due to the conspicuous part played by the clarinet in Variation XIII, a careful assessment of all of its solo phrases in that movement was carried out. The first clarinet solo takes place at Rehearsal 55 which designates the beginning of Variation XIII. It consists of six notes played over three bars as three descending fourths punctuated by two rising seconds. Six melody notes over three bars is a numeric allusion to the opus number 36. The melodic seconds and fourths are remarkable because the integers 2 and 4 are encoded together throughout the Enigma Theme. The clarinet’s opening six solo notes in concert pitch are G, D, E, B, C, and G. They appear on the full score a whole step higher in written pitch as A, E, F- sharp, C-sharp, D, and A. The clarinets perform five harmony notes starting four bars after Rehearsal 55. These notes are not melodic in nature and fall outside the scope of this overview. 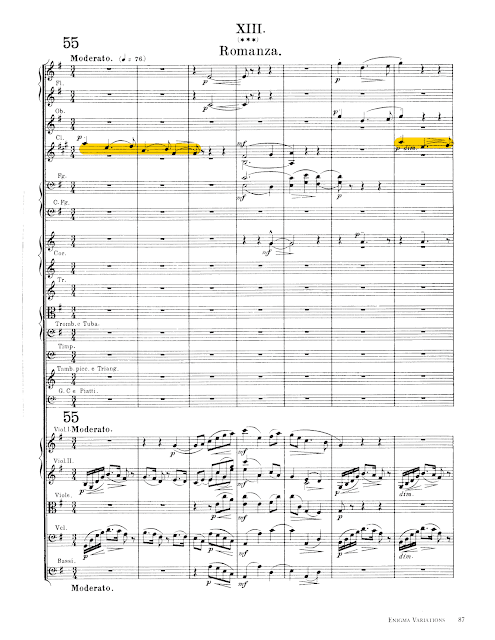 The second clarinet solo phrase begins three bars before Rehearsal 56 and repeats the first three notes of the opening phrase, again as a descending fourth followed by a rising second. Those three notes in concert pitch are G, D, and E, and in written pitch are A, E, and F- sharp. The third clarinet solo phrase occurs one bar before Rehearsal 56 and reprises the last three notes of the initial solo as a descending fourth followed by a rising second. 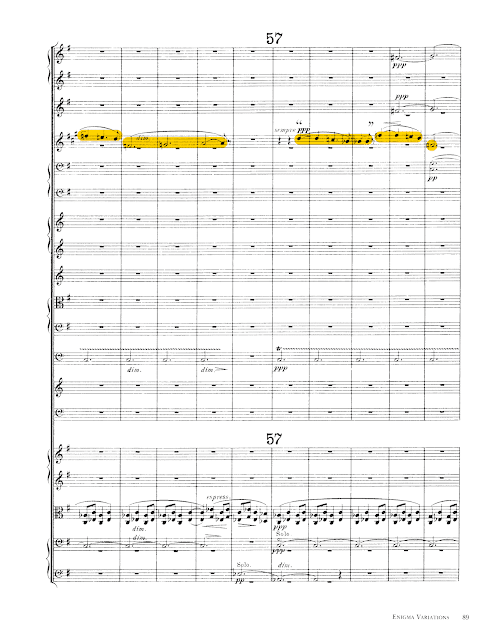 Those three notes in concert pitch are E, B, and C, and in written pitch are F-sharp, C sharp, and D. The fourth clarinet solo commences four bars after Rehearsal 56 for seven bars and concludes two measures before Rehearsal 57. It begins with the first Mendelssohn quotation in A-flat major which consists of four sounding notes: C, B-flat, and two A-flats. In written pitch, they are D, C, and two B-flats. Elgar appended the following six notes as an elaboration of the Mendelssohn quotation: E-flat, D, C, E-flat, F, and G. The written pitches of the fourth clarinet solo are D, C, two B flats, F, E, D, F, G, and A. The fifth clarinet solo commences at Rehearsal 57 for eight measures and concludes two bars after Rehearsal 58. 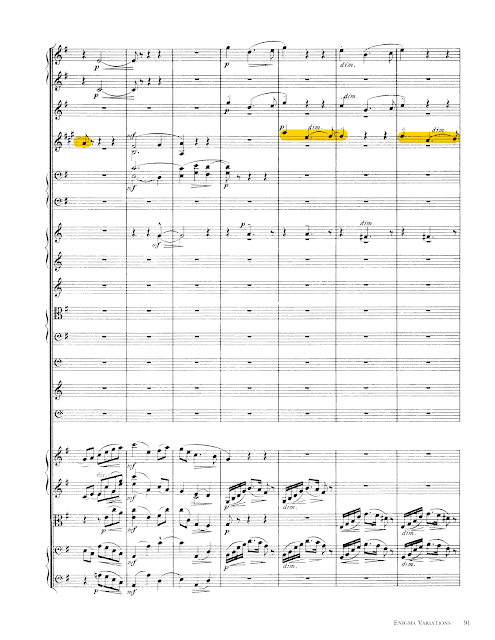 It repeats the Mendelssohn quotation in A-flat major and is immediately followed by six more notes: E-flat, D, C, E-flat, E, and F. The last two notes—E and F—are doubled by the second clarinet which is indicated on the score as A2. Although no longer technically a clarinet solo, these last two notes are a clarinet soli as they are played in unison to produce a louder dynamic. 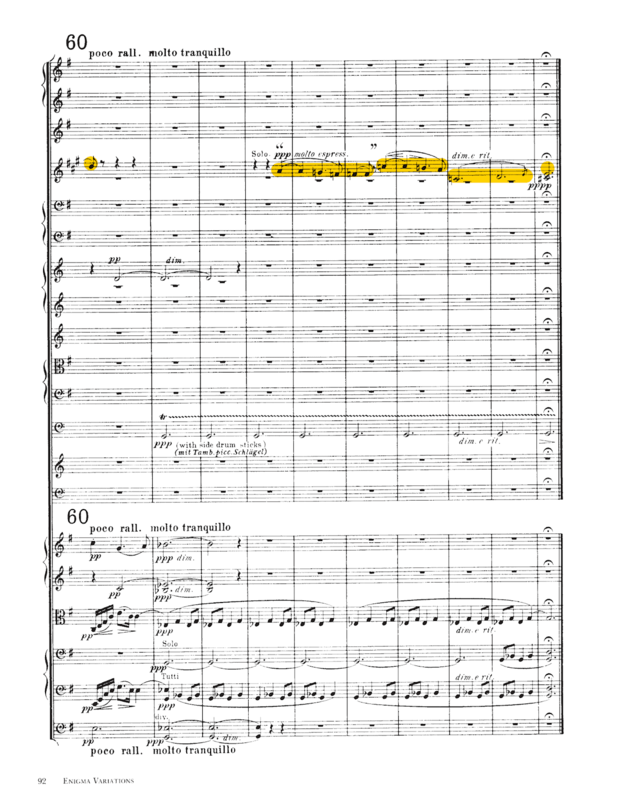 Those two notes are the first two consecutive initials from the covert Theme’s title, Ein feste Burg. The written pitches of the fifth clarinet solo are D, C, two B-flats, F, E, D, F, F-sharp, and G.
Four bars before Rehearsal 59, the clarinets double in octaves five melody notes also played in octaves by three trumpets and three trombones. As the brass instruments predominate in this passage, this particular phrase cannot be reasonably construed as a clarinet solo. The sixth clarinet solo at Rehearsal 59 repeats the first from Rehearsal 55. The seventh and eighth clarinet solos beginning three measures before Rehearsal 60 reprise the second and third solo phrases. 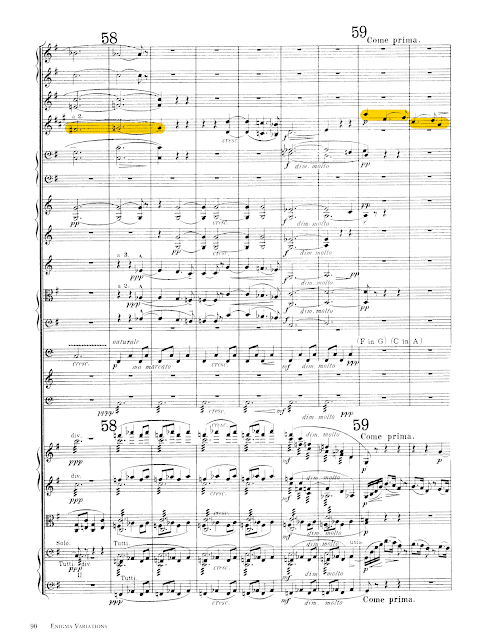 The ninth clarinet solo starts four bars after Rehearsal 60 and continues for seven measures, concluding in the final bar before Rehearsal 61 which marks the beginning of Variation XIV. The clarinet plays the third Mendelssohn quotation in E-flat major comprised of four sounding notes: G, F, and two E-flats. In written pitch, they appear as A, G, and two Fs. Seven more solo notes round out this last Mendelssohn fragment: B-flat, A, G, B-flat, C, and two Ds. They appear in written pitch as C, B, A, C, D, and two Es. 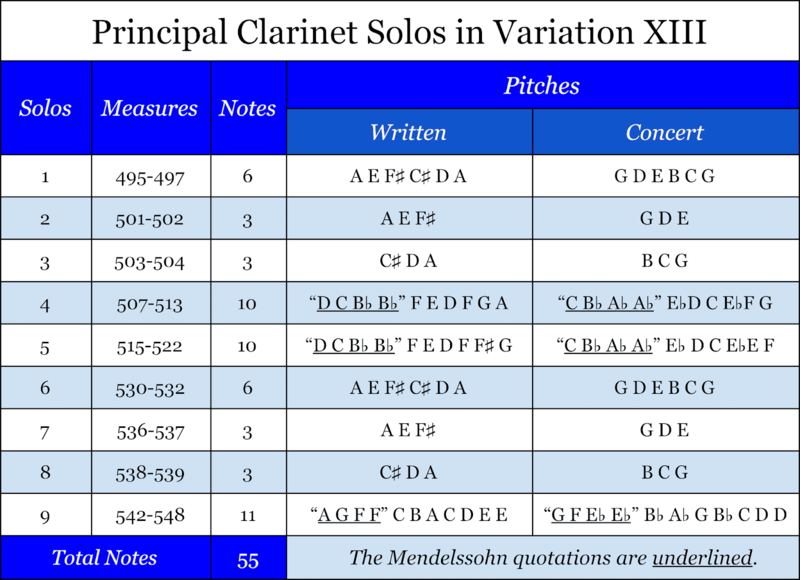 In summary, there are nine distinct clarinet solo passages in Variation XIII. Six of the nine are based on the first solo consisting of six melody notes which are first performed at Rehearsal 55. The repetition of those notes from that opening solo calls for more rigorous scrutiny of that inaugural melodic passage. The note totals for each of these six related solo passages are remarkable because they cycle between 6 and 3, the integers for the opus number (36). The overarching importance of those key letters—A, E, and F—is that they are an anagram of a well known musical cryptogram taken from the initials of the violinist Joseph Joachim’s romantic motto “Frei aber einsam” (Free but lonely). 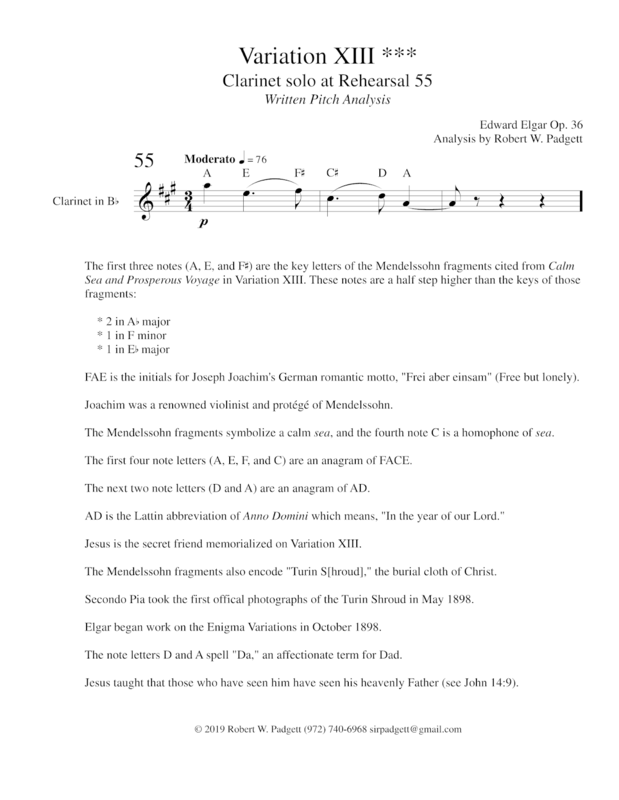 The presence of such an obvious music cipher in the Mendelssohn fragments is extraordinary because legacy scholars such as Julian Rushton failed to detect something so transparently concealed in plain sight. The extensive use of triple initials throughout the Enigma Variations—particularly in the case of Variation XIII with its three cryptic asterisks—should have sensitized the curious investigator to the significance of the Mendelssohn fragment’s three key letters as a coded set of germane initials. Like his fellow travelers in the ivory halls of academia, Rushton missed the proverbial boatload of cryptograms loaded into these Mendelssohn fragments. Joachim was a renowned violinist and protégé of Mendelssohn which renders the encoding of his motto in the Mendelssohn fragments doubly significant. It is not a coincidence that Joachim’s motto dovetails precisely with Elgar’s commentary that the Enigma Theme “expressed when written…my sense of the loneliness of the artist.” Joachim identified himself as a lonesome artist, for there is an ineluctable feeling of isolation at the pinnacle of any art. His motto further hints at two key traits of the covert Theme’s title, namely that it is a German saying composed of three words. Indeed, two of its three initials (E and F) match those of the covert Theme (Ein feste Burg), and the first word is provided by the first three letters of the third word (einsam). There is a similar wordplay at work with the title Enigma, a term that is identical in English and German. Notice also the first three letters of Enigma are an anagram of Ein. 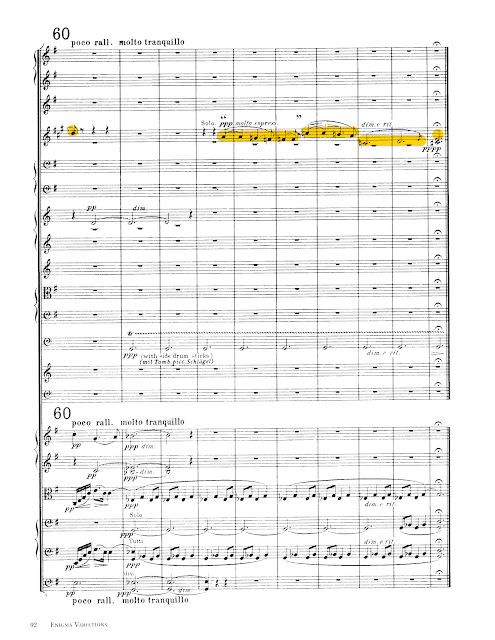 Elgar’s odd word choice for the Theme’s title was not a casual afterthought or publicity stunt, but a deliberate wordplay and linguistic clue regarding the original language of the covert Theme’s title. Enigma is German, and its first three letters are an anagram of the first word from the title of the covert Theme. The Mendelssohn fragments symbolize a calm sea, and the fourth written clarinet solo note—C—is a homophone of sea. The first four written solo note letters (A, E, F, and C) are an anagram of FACE. The next two note letters (D and A) are an anagram of AD, a Latin abbreviation of Anno Domini which means, "In the year of our Lord." Numerous cryptograms reveal that Jesus is the secret friend memorialized on Variation XIII. The pairing of FACE with Lord is readily connected to a famous photographic negative of the Turin Shroud taken in May 1898, five months before Elgar began work on the Enigma Variations. There are various coded references to the Turin Shroud in the Enigma Variations. The most remarkable is the Romanza Cipher located in the Mendelssohn fragments. Roman Catholics are taught that the Turin Shroud is the burial cloth of Christ and that the stunning images revealed by a famous set of photographic negatives taken of that Holy Shroud in May 1898 revealed their Lord’s visage and sacred wounds. The notes D and A spell "Da," an affectionate term for Dad. Jesus called God Abba (Mark 14:36), an intimate name for Father, and taught his disciples that those who have seen him have seen his heavenly Father ( John 14:9). The extraordinary image on the Turin Shroud permits the faithful to gaze on both Jesus and his heavenly Father. A second set of note letters for the opening clarinet solo in Variation XIII is provided by their concert pitch which sound a whole step lower than the written notes. The first two sounding notes (G and D) are a phonetic spelling of God (G-D). These first two notes identify the secret friend portrayed in Variation XIII because in Roman Catholicism, Jesus is divine and a member of the Trinity. The next two notes (E and B) are an anagram of BE. The conjugation of the verb "to be" as I AM is an enigmatic title for God (Exodus 3:14). Known as the Great I AM, this title is encoded as an anagram by the Enigma Theme's rhythmic structure in Morse code as “IMMI.” The contiguous notes B and C are an abbreviation of BC which means "Before Christ." Christ is a special title for Elgar’s secret friend, and its initial (C) is covertly emphasized by the sea fragments featured in his movement. An evil and adulterous generation seeks for a sign, but no sign will be given to it except the sign of the prophet Jonah. For just as Jonah was three days and three nights in the belly of the great fish, so will the Son of Man be three days and three nights in the heart of the earth. Jonah was a prophet commanded by God to preach a message of repentance to the depraved city of Nineveh. Rather than obeying God’s instructions, Jonah fled in the opposite direction to the port city of Joppa and boarded a ship to Tarshish. Jonah vainly hid from God at sea when suddenly a tempest threatened to swamp the ship. The crew suspected that God was angry with one of the passengers and cast lots to unmask the divine offender. Jonah was unmasked, and he instructed the crew that the only way to save their ship and themselves would be to cast him overboard. In desperation, they promptly complied. As soon as Jonah hit the water, the storm dissipated and a large whale swallowed him whole. Jonah spent the next three days and nights inside the belly of the leviathan before being vomited up onto dry land. As first instructed by God, Jonah journeyed to Nineveh and preached a message of repentance. The people listened intently, and the city was saved. Jesus invoked Jonah’s plight as a symbol of his own death and resurrection. This accounts for why one of the earliest and most widely recognized Christograms is the Jesus Fish. The Sign of Jonah shines a theological dimension on the marine atmosphere generated by the Mendelssohn fragments in Variation XIII. Beginning four bars after Rehearsal 55, Elgar encodes the words DEAD G-D in the lowest and highest voices of the orchestra. The bass section plays the notes D-E-A-D in measures 498 and 499, and the woodwinds follow with three statements of the notes G and D in measures 500 and 501. 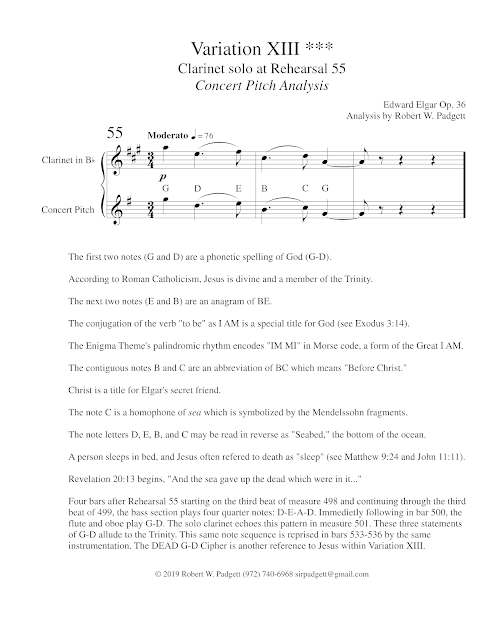 The note sequence G-D is played three times as an explicit allusion to the Trinity. Elgar replicates this cipher in with the same voices beginning four bars after Rehearsal 59. These cryptographic allusions to a dead deity in a movement that sonically portrays a calm sea (Mark 4:35-41) are easily tied to Jesus and the Sign Jonah. 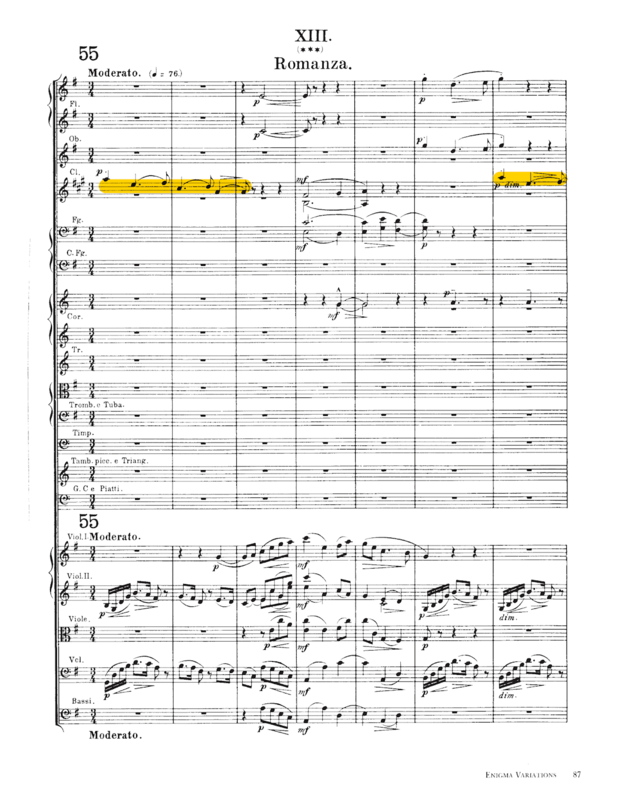 Elgar identified the original short score of this movement with a capital L and “X X X” in blue pencil. The letter X is a symbol for the cross, and there were three crosses at the crucifixion of Christ. Blue is also the color of a special thread in the Tzitzit that symbolizes the role of the Messiah as a Royal Priest and King. The first encoded word in written pitch is FACE, and the first in concert pitch is G-D. These combine to form "Face God" and "God Face," two decryptions that are easily associated with the Turin Shroud. 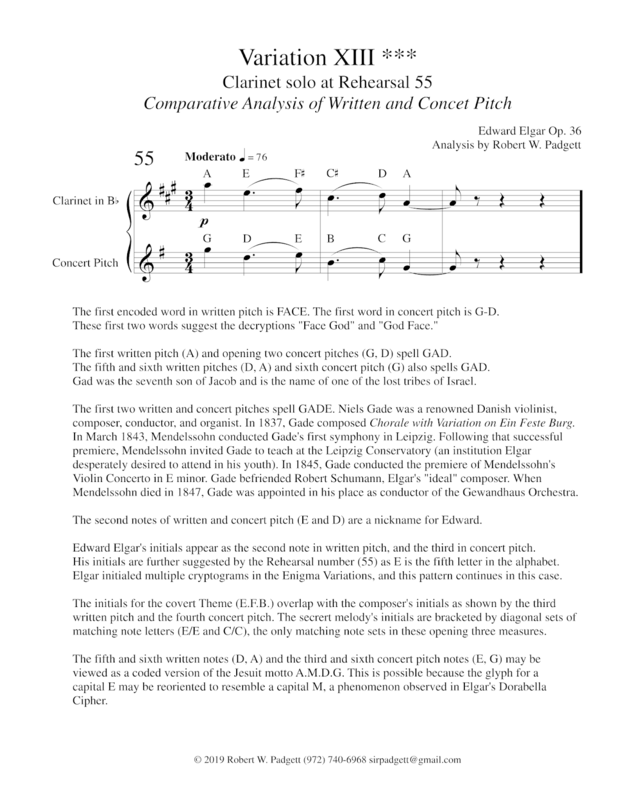 The first written pitch (A) and opening two concert pitches (G, D) spell GAD. 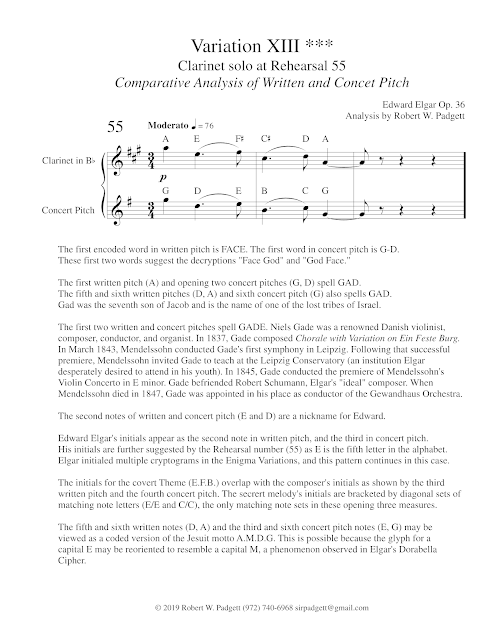 The fifth and sixth written pitches (D, A) and sixth concert pitch (G) also spells GAD. Gad was the seventh son of the biblical patriarch Jacob and is one of the lost tribes of Israel. This is the only tribal name that may be correctly spelled using musical notes. Joachim’s first name, Joseph, is another Israeli tribe, and the name of Jesus’ stepfather. Elgar would eventually permit the public to indulge in the speculation that his secret friend was Lady Mary Lygon, but this was an obvious ruse and form of “missdirection.” Sir Ivor Atkins and Ernest Newman who were close confidants of Elgar were confident that Lady Mary could not be that famous personage. There is a straightforward explanation for why Elgar encouraged the notion that Lady Mary was that secret friend. The reason is her name is an exact match for his covert friend’s eminent mother, the Virgin Mary, who is respectively called Lady Mary by Roman Catholics. These coded references to Joseph Joachim and Lady Mary Lygon cleverly provide the forenames of Jesus’ parents identified in the Gospels. The first two written and concert pitches spell GADE. Niels Gade was a renowned Danish violinist, composer, conductor, and organist who composed numerous symphonies, a violin concerto, sacred cantatas, and other works. Elgar was also a violinist, composer, conductor, and organist who produced symphonies, sacred cantatas, a violin concerto, choral pieces and works for other genres. Gade contributed two sacred cantatas to the Birmingham Festival, Zion and The Crusaders, that latter of which celebrates the liberation of Jerusalem during the First Crusade. At the conclusion of the original Finale of the Variations, Elgar cites a paraphrase from Jerusalem Delivered, an epic Christian poem by Torquato Tasso which mythologizes that First Crusade. Gade composed the organ work Chorale with Variation on Ein Feste Burg, a heroic hymn that serves as the secret melody to the Enigma Variations. Elgar’s coded reference to Gade is full of hidden parallels to himself, the melodic inspiration behind the Enigma Variations, and the secret friend who is named in the second stanza of Ein feste Burg. In March 1843, Mendelssohn conducted Gade's first symphony in Leipzig. Following that successful premiere, Mendelssohn invited Gade to teach at the Leipzig Conservatory where he became an active member of the Mendelssohn circle which encompassed Ferdinand David, Robert Schumann, and William Sterndale Bennett. In his youth, Elgar dreamed of attending the Leipzig Conservatory but was compelled to abandon his plan due not to a lack of talent, but funds. Gade conducted the premiere of Mendelssohn's Violin Concerto in E minor in 1845 and befriended Robert Schumann, Elgar's "ideal!" composer. When Mendelssohn died in 1847, Gade was appointed as his successor to conduct the prestigious Gewandhaus Orchestra. 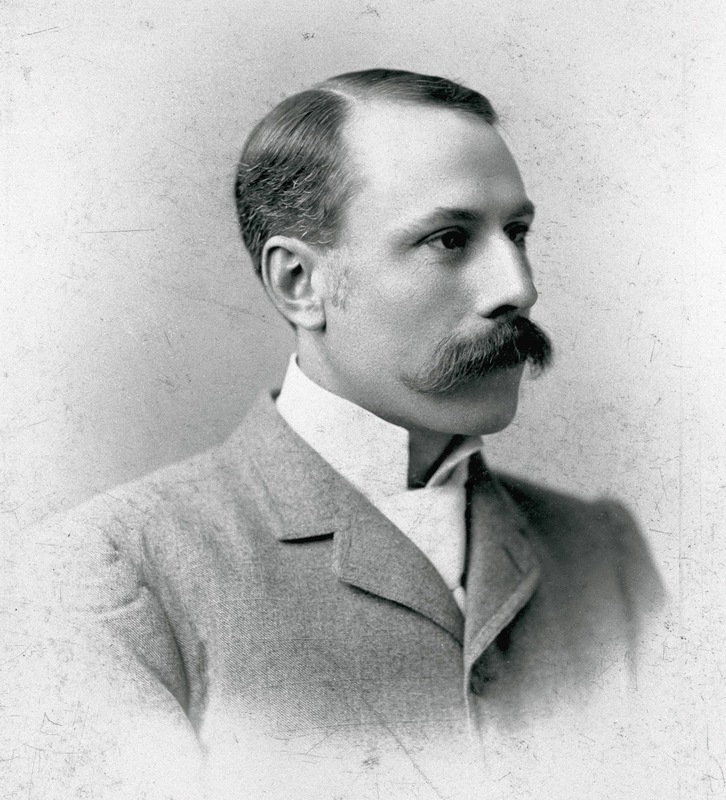 Elgar was certainly familiar with Gade's music as documented by biographer Jerrold Northrop Moore. In a letter from December 1886, Elgar heaps praise on Brahms as “the classical composer par excellence of the present day: one who, free of any provincialism of expression or national dialect (the charming characteristic of lesser men: Gade, Dvořák, Grieg) writes for the whole world and for all time…” Elgar’s coded reference to Gade is a stealth homage to his famous mentor, Mendelssohn, and highlights a common Theme quoted in their compositions: Luther’s A Mighty Fortress. The second notes of written and concert pitch (E and D) are a nickname for Edward. It is fascinating the names GADE and ED are encoded by this opening four notes. Elgar’s initials appear as the second note in written pitch, and the third in concert pitch. They are further suggested by the Rehearsal number (55) as E is the fifth letter in the alphabet. Elgar initialed multiple cryptograms in the Enigma Variations and this pattern continues in this context, adding a stealth form of authentication. 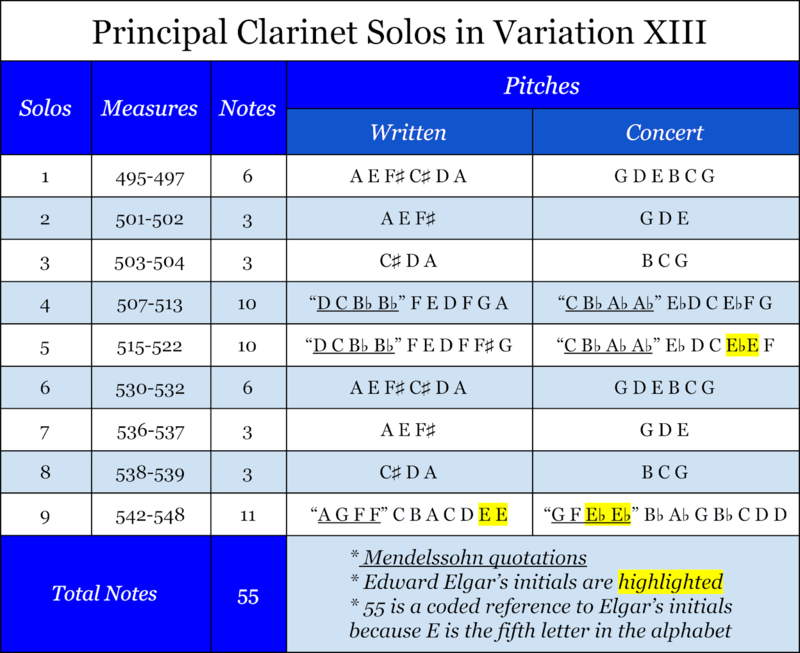 As highlighted in the table below, Elgar’s initials appear in the written and concert pitches of the clarinet solos in Variation XIII. Notice that the initials for the covert Theme (E.F.B.) overlap with the composer's own as shown by the third note in written pitch and the fourth note in concert pitch. The secret melody's initials are bracketed by diagonal sets of matching note letters (E/E and C/C), the only matching sets in these opening three measures. The letters CCEE are a phonetic spelling of SEE and SEA. The initials for the covert Theme are symbolically immersed in the sea, a feature confirmed by the Mendelssohn Fragments EFB Cipher which ingeniously encodes them. 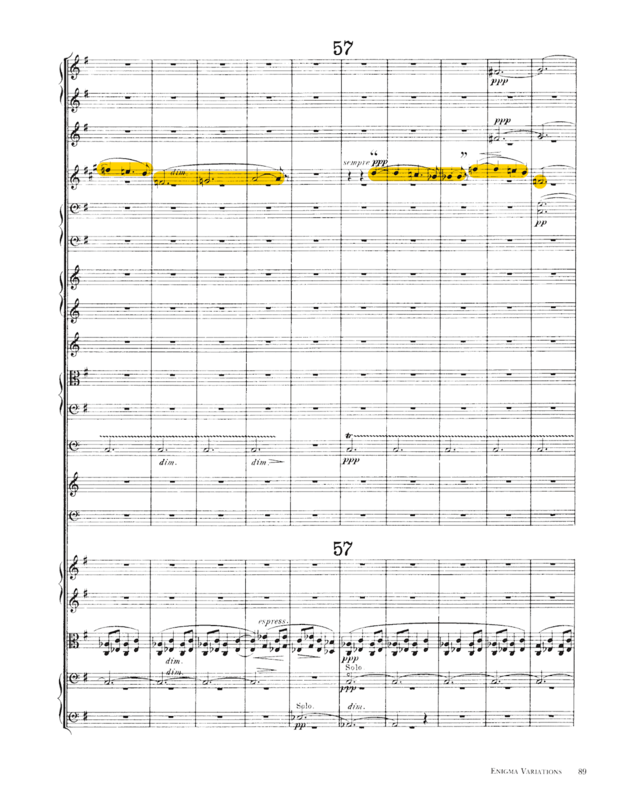 It is also relevant to observe that Elgar employs an ingenious Dual Initial Cipher to encode all six initials of the covert Theme’s German title. 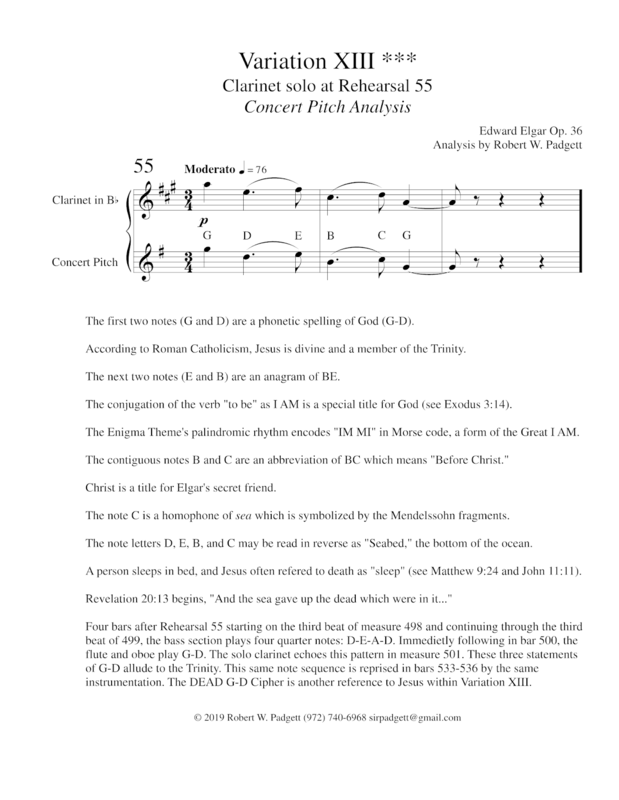 The fifth and sixth written notes (D, A) and the third and sixth concert pitch notes (E, G) may be viewed as a coded version of the Jesuit motto A.M.D.G. This is feasible because the glyph for a capital E may be reoriented to resemble a capital M, a practice exhibited in Elgar’s Dorabella Cipher. 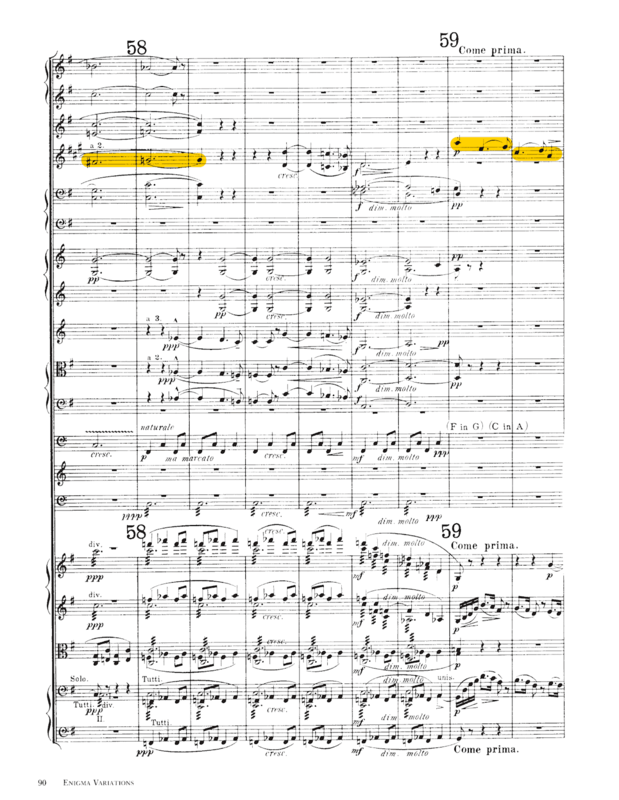 It is deeply symbolic the principal clarinet performs precisely 55 melodic solo notes in Variation XIII with the first beginning at Rehearsal 55. Three pairs of clarinet solos share an equal number of notes: 3, 6, and 10. When paired together, the two lowest numbers (3 and 6) form the Opus number, 36. Those two integers are associated with the covert Theme’s title which consists of six words (Ein feste Burg ist unser Gott), but it is commonly abridged to three (Ein feste Burg). The numbers 3 and 10 encode the secret friend’s initials (JC) using a simple number-to-letter key, the same form of encipherment tied to the Roman numerals XIII. According to Roman Catholic tradition, Jesus died at the age of 33. The Nimrod Timpani Tuning Cipher is initialed by the composer due to its placement at Rehearsal 33, for that number is the mirror image of Elgar’s two capital cursive E’s. Just one clarinet solo has a distinct number, the last at 11 as the result of an added grace note. That sum is connected to the covert Theme’s title which has 11 discreet letters, an important number for someone attempting to crack the Enigma Theme Music Box Cipher. 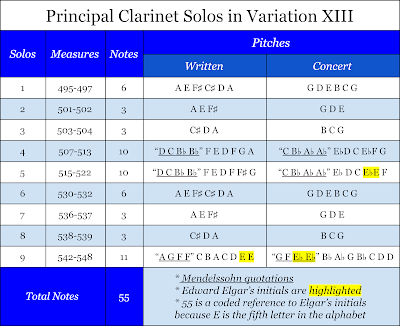 The remarkable numeric connections between the number and note-lengths of the clarinet solos to the central mysteries of the Enigma Variations venture far beyond the realm of coincidence. Mendelssohn, Joachim, Gade, and Goethe all share the common life experience of being raised in the Protestant tradition as Lutherans. In the case of Mendelssohn, Gade, and Goethe, they also cite Luther’s musical or literary output in their compositions. Although Goethe abandoned his faith as an adult, in his formative youth he “acquired a thorough knowledge of Luther's translation of the Bible, which left its mark on his conversation, letters, and literary work.” Meredith Lee even likens the concluding stanza of Goethe’s Die erste Walpurgisnacht to that of Ein feste Burg. Mendelssohn set Goethe’s poetry to music as a secular cantata in 1843. Mendelssohn was baptized a Lutheran and liberally quotes Luther’s hymn Ein feste Burg in the fourth movement of his Reformation Symphony followed by a set of variations. Elgar’s four citations of the Mendelssohn fragment in Variation XIII conveniently pinpoints that exact movement and implies by imitation that Mendelssohn quotes the covert Theme in one of his own works. Gade quotes Ein feste Burg in an organ work which includes a variation. The discovery and decryption of the Rehearsal 55 Clarinet Solo Cipher was the result of connecting the dots. In this context, those dots are the written and sounding note letters. Careful attention was paid towards the clarinet solos in Variation XIII because that instrument is assigned the sole task of performing the anomalous Mendelssohn quotations from Calm Sea and Prosperous Voyage. Six of the nine clarinet solo passages in that movement repeat all or three-note segments of the introductory six-note solo. With so much emphasis placed on these opening six notes, the first clarinet solo was carefully sifted for prospective musical cryptograms. The decryptions affirm the identity of Elgar's secret friend memorialized in that variation and divulge the initials of the covert Theme. Like a number of other ciphers from the Enigma Variations, Elgar's dual initials appears among the decrypts as a clandestine form of authentication. To learn more about the innermost secrets of one of Elgar's symphonic masterpieces, read my free eBook Elgar’s Enigmas Exposed.